Book blogging is life-changing. Or at least reading-life-changing (I think I’m safe with that assessment). I’ve been influenced by other bloggers more than I ever imagined possible when I started out. It has come to this: I hardly ever read a book anymore if I haven’t previously heard about it through my network. And, funnily enough, sometimes books hear about me and come searching. Or make that a book’s author. In this case, Ramin Ganeshram scouted me out via Reading in Color (a really fantastic blog! ), and had a publicist send her novel Stir It Up! for review. When you read the synopsis, you’ll see why this one ‘fit’ me exactly. Thirteen-year-old Anjali's life is rich with the smell of curry from her parents' roti shop and an absolute passion for food. More than anything, Anjali wants to be a chef who competes on a kids' cooking reality TV show. But Anjali must keep her wish a secret from her family, who thinks Anjali's passions are beneath her. Thank goodness for Deema, Anjali's grandmother, whose insight and love can push past even the oldest family beliefs. Woven with recipes that cook up emotions and actual culinary recipes that make food, this novel is as delicious as it is satisfying. Take a talented kid with the skill and drive to succeed. Mix in one special opportunity, along with family pressure and disapproval. Add in a questionable decision, forgiveness, and bake with a touch of real life, and you get… Anjali’s story! Stir It Up! is a middle grade contemporary novel filled with food, cultural lessons, and best of all, healthy family dynamics. One of the things I liked about the book is that Anjali and her family cooked together (watch out: it all sounds delicious and it will make you HUNGRY), and the recipes for that food were included at the end of each chapter. In fact, I tried one myself. If you want to check out Coconut Chocolate Chip Cookies, I suggest you go out and get yourself a copy of Stir It Up! Other pluses: introduction to Trinidadian-Indian-American culture, and the tight family scene. I can honestly say that I learned about food and more, but I never felt as if I was reading an educational book – just an enlightening one. Also, the protectiveness and cohesiveness of Anjali’s family reminded me of my own close-knit family. Bonus factor: Anjali’s best friend Linc (I have a brother named Lincoln!). As Anjali is the main character, most of the book centers on her and her experience. Though she learns powerful lessons, she focuses so much on negative emotions that it is hard to get in her skin. I found Anjali interesting, but I could not connect with her. Favorite characters included Deema, with whom I’d like to sit down and sip tea and talk about life, and Chef Nyla, who helps kids learn to cook on a daily basis. Those are two wise ladies! Recommended for: fans of contemporary middle grade fiction, anyone who has watched food shows and wondered about what goes on behind the scenes, and those looking for a good dose of diversity in their reading AND their food. Delicious! Fine print: I received a copy of this book for review from Scholastic. It does look like a book you would like, with all of that cooking! 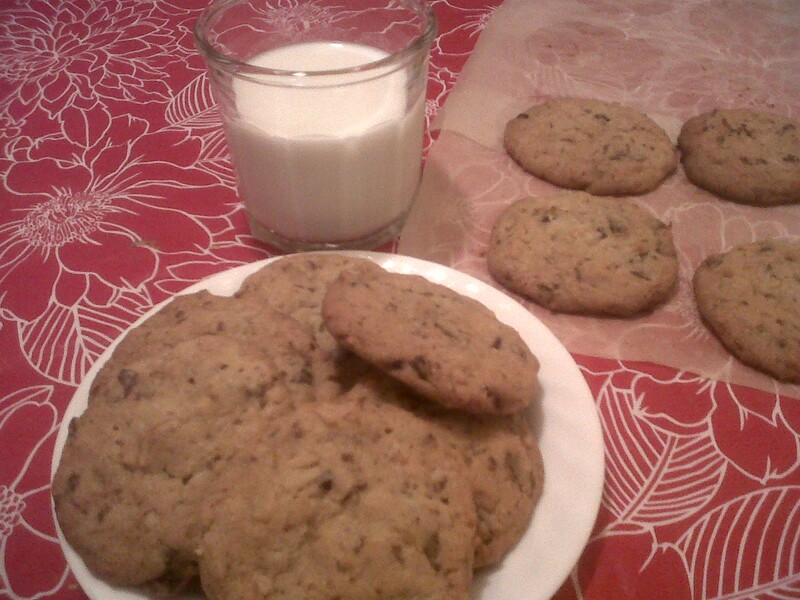 :) Those cookies look fantastic - glad you enjoyed the book. It sounds awesome. This one is on my wish list.